Find ANY selected card in the deck - and do dozens of other tricks! Find ANY selected card in the deck - and do dozens of other tricks! Authentic S.S. Adams packaging! This deck makes card magic as easy as flipping through the deck! One of the most useful decks available! You'll be able to perform some truly astounding card tricks instantly- with no skill, no experience necessary! Great for beginners- incredible in the hands of the pros! Let your spectator remove a card from the deck and then replace it ANYWHERE in the deck. You can always immediately find the card! You can do hundreds of tricks with this deck! Find any selected card in the deck- instantly! Remove all four aces from the deck at the same time! Find a selected card after the deck has been shuffled by someone else! Make a selected card magically and suddenly appear- in your pocket! Seemingly pass a selected card right through a table! Magically separate the red cards from the black- in an instant! Best of all, tricks done with this deck can be repeated immediately. 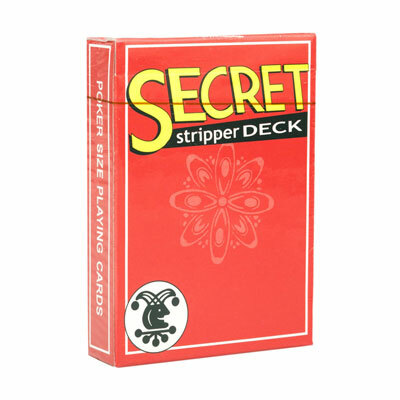 By the way, the name of this deck, Stripper Deck, refers to the way the cards are cut, or "stripped". It is NOT an X-Rated trick in any way! 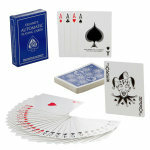 It is simply a cleverly cut deck of cards that allows anyone, even children, to perform some astounding card tricks! The Stripper Deck is similar to the Svengali Deck in that each deck has specially cut cards that help you do great card tricks with no sleight of hand. This Stripper Deck, however, can be handed to the spectator and shuffled if necessary. Deck has a custom back design, not Bicycle back. Sorry, no color choice for the back design- we ship what is currently IN STOCK. Cheaper than the other stripper decks and works the same way. Its okay of you drop the deck too because its easy to put it back together. Does not have a bicycle back.